I started my life as a full-time Mac editor in 1994, just as the 680X0-to-PowerPC transition was beginning. This new PowerPC-to-Intel transition reminds me of the Mac’s previous chip transition—but there are also many differences. The PowerPC transition was spurred by the flagging performance of Motorola’s 680X0 chip line, as well as the improved speed of Intel’s then-new Pentium chip. Jumping from a 68040-based Quadra to a PowerPC 601-based Power Mac resulted in a noticeable speed boost. The forthcoming transition is more about future speed improvements; as a result, the jump from latter-day PowerPC systems to first-generation Intel Macs probably won’t offer such dramatic speed increases. When the PowerPC transition happened, Apple actually sold upgrades for Quadras so that they could run as Power Macs. Some of them came in the form of complete logic-board upgrades. Although Apple has remained mum on the matter of upgrades, it’s highly unlikely that there will be any Apple-sponsored upgrades that will turn PowerPCMacs into Intel models. And it’s unclear whether clever upgrade-card companies will be able to find any way for users of Power Mac G5s to install an Intel processor in their systems. Unlike in 1994, today’s Mac users are much more knowledgeable about concepts such as native applications and even emulation mode , thanks to the refresher course we got during the move from OS 9 to OS X. But the 1994 rules still apply: emulated applications (running via Rosetta, in this case) will be slower than Intel-native versions. As I reviewed my 1994-era Mac magazine collection, it became clear to me that every transition is a time of confusion and fear, as well as of great opportunity. 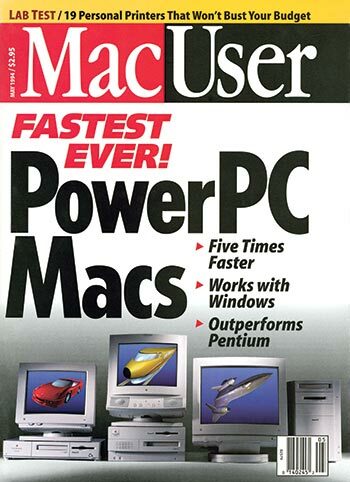 It was interesting to read these words, which appeared in the May 1994 issue of MacUser : “With the introduction of the [Power Mac], Apple…is relying on developers to write native software [and] relying on us to purchase Power Macs and then to buy upgraded software. If [that happens], then the Power Macs will launch Apple toward the 21st century.” Well, here we are in the opening years of the 21st century. Now it’s time to launch Apple deeper into the heart of it.